2 Cor. 7. Marin Cilic served three aces in a row in his last game to defeat Roger Federer in the U.S. Open semi-finals. He crushed it in the finals. He served up 17 aces to Nishikori. Cilic, at six foot six, is not the first tall man to use his height to achieve impossible angles on a serve. But he may be the first to serve so well, so consistently. If he can keep his game up at this level, he will be unbeatable. Watching him ace Federer was heart-stopping and yet also strangely relaxing. Once the ace hit the earth, you could breath. You didn’t have to tense every muscle in your seated body anymore, waiting to see who would mess up first. You didn’t have to wince as someone succumbed to nerves and smashed an easy shot into the net. The point was over. Victory was achieved. Fooof. Meanwhile, a painful performance of a different sort occurred right before the women’s final. When one of the Jonas brothers stepped forward to sing God Bless America, we all winced. We all held our breath. Even before he started to sing in what the press called “an off-key whisper falsetto,” we knew he was doomed. The song is notoriously difficult to perform. The press called Jonas’ a “painful rendition.” USA Today, Sept. 7, 2014. False sorrys are painful. Deep down, just as we all know what it sounds like to sing on key, I think we all know what true repentance should look, sound and feel like. How could we possibly know this? The Bible says we have God’s laws written on our hearts. And God demands that we say sorry, but he wants us to be really sorry. It’s not about walking around guilty. It’s the opposite. God’s kind of sorry is totally liberating. But first it involves a death. It involves dying to self, as the Bible puts it, and that is painful. We have to kill our pride, kill it dead, and our pride is really just so prickly. But the benefit is so worth it. In this passage in 2 Cor. 7, Paul writes that being truly sorry leads to life, but that false sorry leads to death: “For the kind of sorrow God wants us to experience leads us away from sin and results in salvation. There’s no regret for that kind of sorrow. But worldly sorrow, which lacks repentance, results in spiritual death.” 2 Cor. 7:10. 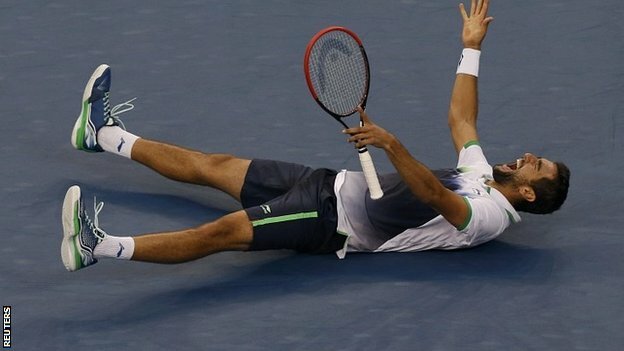 That’s why I started this post with a photo of Marin Cilic lying on the ground almost sobbing and laughing with joy after his victory. In that moment, Cilic was fully alive. THAT is what true sorry looks like. That’s the kind of experience God wants us all to have with our sorries. The fascinating thing is that I think most of the time most of us are NOT at all sorry. Most of us experience what the Bible here calls wordly sorry that leads to death. I think that means not just that we’re just sorry we got caught. I think it goes far deeper than we realize. I think that on a very fundamental level, we just aren’t sorry at all. In fact, what we experience as regret, I think is just that we’re mad at the other person for bringing it up. How do I know? My most powerful example is one I’ve written about before. It happened after I threw a metal garden spear like it was a javelin at one of my younger brothers. The spear hit him just above the eye. He still bears a scar. He used to bring that incident up on a regular basis, and every time, I’d just shake my head and be slightly annoyed. Why does he keep dredging it up, was the refrain of my hard heart. Then one day when I was about 40 years old, after the Holy Spirit got a hold of my heart and started tenderizing it like raw meat, I was sitting with my brother at a wooden table full of carved initials, including ours, at our skating club. It suddenly hit me. “Don’t worry about it, Caroline,” he said in a gruff voice. He stuffed about fifty french fries in his mouth. And he’s never raised it since. He doesn’t need to. I was, and am, finally sorry. The fascinating, and terrifying part of that story for me is that I didn’t even know I wasn’t sorry. That, I think, is the human condition. I think most of us just aren’t sorry, and we don’t even know it. So what are we to do when we get the usual mealy-mouthed apologies from people, generally uttered because we’ve forced them at virtual knife point to apologize to us or else? What are we to do when people hurt us? How are we to “make” them be sorry, by gum? I’m not sure. But I THINK the answer is to be merciful, very very, merciful. I think that if we tell them in a loving way that we don’t want them to use that tone with us, or call us that name, or treat us that way, they can at least hear the truth of our complaint. If we tell them the truth in hatred, all they can hear is our hate. I think that means they can only hear that we, too, are now sinning and they’re thinking: ah ha! You’re not so special yourself! Don’t get all high and mighty with ME! Look to your own problems, dude! So speaking the truth in love is a good start, and even that is pretty impossible to do if someone’s really hurt us. I think it requires forgiving them, mightily, before we speak up. It certainly requires speaking calmly. “A gentle answer turns away wrath.” Sometimes we might need to go further than just pointing out the ills of their ways and set boundaries. “Do not rescue an angry man from the consequences of his sin, or you’ll just have to do it again.” If they’re hurting us, and not sorry, and they refuse to stop, we might have to walk away, disengage, even disappear. But those are issues of how we handle someone else’s sin. The question before us here is how do we handle their lack of repentance? This passage suggests we can’t do anything about making someone sorry. It suggests that repentance is a gift from God. The main thing for us humans, I think, I think, is to recognize that for someone to do evil to us carries its own punishment. The Bible is clear. To treat people fairly makes humans happy. The opposite is also true. When we act unfairly toward others, it makes us miserable. Miserable people behave badly. In other words, instead of focusing on how to make the other person BE sorry, perhaps we are to BE sorry ourselves – for them. If we focus more on how miserable they must already be, it might just minimize our instinctive fleshly desire for retribution. I say all this humbly, because if someone hurts me, I just want to hurt them back. All too often I do. I bad mouth them, just a little, on the edge of propriety. I think of them poorly in my heart. I dredge up every rotten fact about them I can think of. I exaggerate. I imagine them at their worst. It’s despicable. It’s the way we’re made. It’s not a good thing. It’s bad. So I think we need to ask God to help us be sorry for our own reaction to evil. Because being sorry, like all gifts from God, is life giving. True sorry is music to everyone’s ears. True sorry is relaxing. It’s when, as C.S. Lewis says in THE GREAT DIVORCE, we suddenly realize we’ve been all wrong all our lives about almost everything. It’s so unbelievably freeing. It’s where true life begins. It’s where we can lie on the ground, like Cilic, with our eyes open, grinning and laughing and weeping with joy. Instead of being afraid of apologizing, or apologizing stiffly or reluctantly, or with qualifiers that point out the OTHER person was pretty rotten, too, sorry can begin to be something we delight in doing. Sorry can be the first thing we say when we’ve done wrong. It’s good parenting to model it to our kids. It makes for good relationships. It is good. And yes, of course, true sorry means being so sorry we resolve never to do it again. And when we do DO it again, that’s where the cross comes in. Jesus experienced hell so that when we give hell to others, and we’re really sorry, and yet we do do it all over again, and we hang our heads in shame and we’re starting to feel we are a very sorry specimen of humanity indeed – God will come and sing to us that He DOES bless us. He will sing to us in the most piercing beautiful notes we’ve ever heard that it’s okay. When we keep behaving badly, we might lose a relationship. Bad behavior does that. But we will never lose our God. He will always hang in there, even through our most painful renditions, our falsetto whispers, our off-key attempts to hit the impossible notes. God sings on key, always. He created all the keys. He asks only that we join in his chorus. And if we don’t feel like singing, at least showing up in a robe counts. That’s my way of saying we never earn God’s love anyway. He just gives it freely. So showing up is a way of acknowledging that we know whose team we want to be on. What we forget is that just trying to sing in the face of evil is itself beautiful. The singing is another way of saying God calls us to love in the face of hatred. He asks us to “open our hearts” to Him when we’re attacked, even though our natural instinct is to close off our hearts to everyone, including Him. 2. Cor. 7:2. We forget that God wants us to keep loving, because when others hurt us we can trust Him to comfort us: God “comforts and encourages and refreshes and cheers the depressed and the sinking.” 2 Cor. 7:7. But the only way to get that comfort is to turn to him in trouble instead of away. “The Irving Berlin song, which was first recorded by Kate Smith for CBS radio in 1938 as the clouds of war hovered over Europe, was also sung yesterday at the reopening of the New York Stock Exchange, where Rose-Ann Sgrignoli, a 39-year-old major in the Marine Corps, found herself, to her surprise, leading a chorus of Wall Street traders, corporate executives and politicians. ‘It was quite an experience when they started singing along,’ she said afterward. ‘The N.Y.S.E. is a pretty tough crowd, but when they did that, I really felt we are all in this together. '” NY Times Sept. 19, 2001. We are all in this together. We’re all straining to achieve these impossible notes together. We need to be merciful to each other as we hit the falsetto whispers of our fake sorrys. Because by giving love in the face of hate, we are reaching for the highest notes, spontaneously, and we sense that just to try is an achievement itself. p.s. In Kate Smith’s 1938 performance, which you can watch here on You Tube, Miss Smith steps to the mike in a long black dress, white bow and bright red lipstick. “Hello everybody,” she says. “It is my happy privilege to introduce a new song. God BLESS America!” She sings, with violins, then flutes, then trumpets, then a full on chorus helping her out. Finally, she holds that last home forever and a day. Which is exactly what God is going to do for us. Amen. This entry was posted in 2 Corinthians and tagged aces, godly sorrow, Marin Cilic, repentance, sorry, what sorry looks like, what sorry sounds like by Caroline Coleman. Bookmark the permalink.